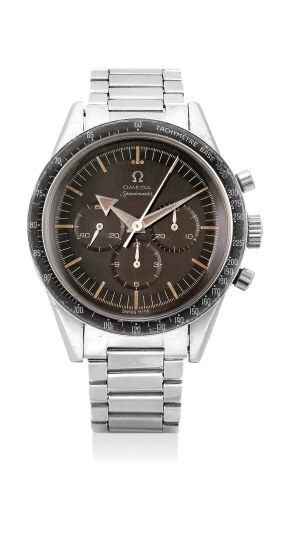 Here is a watch for sale at www.OmegaForums.net. I am reviewing it because it brings up a few questions about the way we view watches on sale. I wrote this last week, but published this only after the watch is sold, as I do not wish to unintentionally influence a sale. I have no connection to the seller and I am not recommending to buy it, but I do suggest all of the literally dozens of people who ask me about an entry level 145.022 to at least look at this and wonder if the re lume is worth living with at $5500. Essentially this is a good looking 145.022-69 with a DO90 bezel and a dark chocolate dial. And the price has just been reduced to $5500. Why has it not sold? Some people would pay more than half that for the bezel! Well it must be primarily because of the declared re lume. Here we see the DO90 and also a closeup of the lume – note it does not cover the whole of the under paint and it is not applied evenly. We can see the same thing in original lume, but not quite the same. However it is similar enough to look original to most. Picture cropped from sale photo. The owner has declared the dial and hands as re lumed. In the past, re lumes were very easy for most to spot, and were not very good. Now, we have some very skilled technicians, well one in particular, who can replicate an aged lume on a dial, often making the watch extremely attractive and without any obvious signs of work, especially to a less experienced collector. Unfortunately, the work in this case is not top, but it is quite good. It may be possible to remove it and re apply where it is sloppy. In the following image we can see the imperfections in the work. The 11 mark has two lines extending from it, the 12 spots do not look normal and the 1,2 and 3 marks look sloppy. In the following image we see the hands are easily spotted as painted and re lumed as the work is not the highest standard available. Note the finish on the hands is shiny, and uneven – I want to say lumpy. It can never be confused for original, but it would be an easy fix. 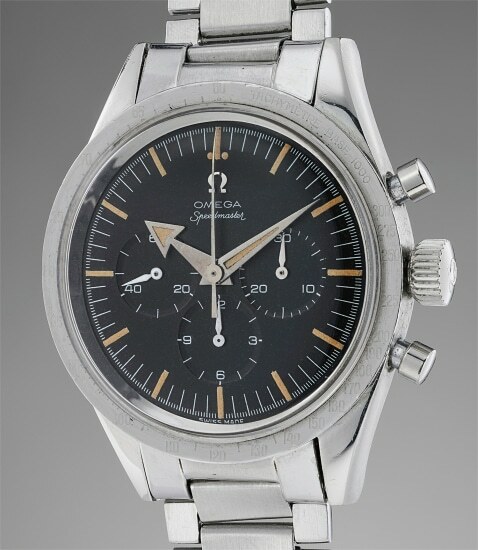 In this case, the seller has correctly declared the work, but I am sure that there are others who would not have declared it and the watch would have been sold quickly at the initial price of $7500. What I realise is that the private sellers on the forums have become quick to be up front about work done on watches. This is to be welcomed. On the other hand, buyers are not quite so ready to accept this honesty, and sometimes they go and buy a relumed watch from a dishonest person who has told them it is not relumed. Everything has a price. And I think the price here is about right. I was even tempted to buy it myself, but I did not. What I am saying, is that I personally am not quick to dismiss a re lume if it is up to a standard, and down to a price. Remember after all, what a dial washed of lume looks like, and which would be nicer to live with. The original listing for this watch is here. Yesterday I took a trip to Geneva, and I held more 2915’s in one day than I have handled before in such a short space of time. It was a great learning experience. Please remember that I really do not know a lot about 2915’s. I do not have special access to Omega like others have, and I have not seen a great number. I try to learn by looking and talking to others, but I am also learning that there are a lot of people who say they know a lot but what they say does not always fit with my observations. So as ever, if you are a buyer for these very expensive watches, be your own expert. I am reminded of the phrase, “In space no one can hear you scream”. What I mean in this context is that there are not many trustworthy advisers for a 2915 – and they may not hear your cries for help. All of them set the Gieger counter off, testing positive for radioactivity, at least somewhere in the watch. The first two 2915’s discussed below are much better than the others discussed. There is a general feeling that the two Phillips watches might have been expected by many to have sold for more, but in the event did not explode – suggesting a flattening of demand. Here is the first at Phillips. Straight from the Iphone but we can see immediately the catalog photo does not capture the essence of the watch. The dial colour is truly galaxy and pleasant. Delving deeper into this particular watch, the hand lume looks very new. It also compliments the dial so well it is hard to imagine it is not a restoration. The Geiger counter clicked away happily so there is Radium somewhere in the watch. We always have to remain skeptical as it is known that some restorers place a dab of radium under the dial to fool those checking with a Geiger meter alone. 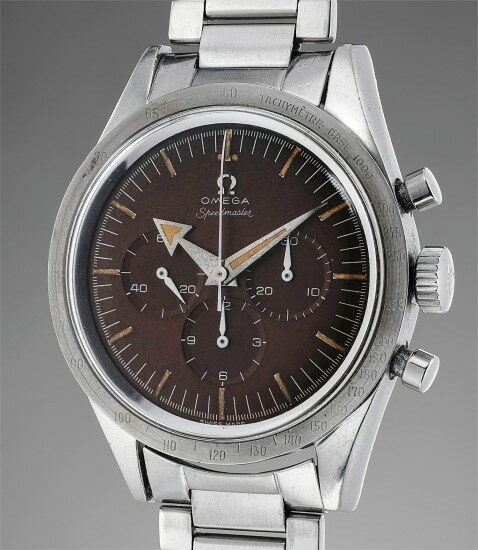 The case was good and had the speedmaster engraved abound the edge. In general i liked the case, it had good definition and the years had not been cruel. I do not think it has been refinished though I am sure like every sixty year old tool watch it has had some sort of polish. Now the bezel. I simply do not know enough. For a while I proposed that the engraving was by pantograph. Now people with knowledge tell me it was acid etched. I can see even just in this one day in Geneva that there are bezels with serifs and bezels without. All look aged, but I cannot tell if it is old. All the bezels I examined showed concentric polishing marks – presumably from the bezel being placed in a lathe and polished. I would imagine that this would have been done during a service to remove dings and scratches on an original bezel, but also to reduce the height of a reproduction bezel. So all this leaves me to value all 2915 bezels for the price of the repro – which in itself is currently more than a cheap 145.022. This tropical dial sold for $200,000 all in. I was honestly expecting it to go for more, and indeed the estimate was up to $300,000 plus premium – so I think the seller thought it would go more too. As I have said, it was a very attractive watch in hand. I thought this one was superb. So good that I asked the on-site watchmaker to tell me if it was relumed. (Why would I trust him, the employee of the seller? Well obviously I do not know him, but one has to take all information one can, and I do not distrust him either. In general, I find people with technical skills tend to be far less devious than the people who are further up the client interface ladder). He told me he thought the lume is original, and indeed the Geiger counter once a gain clicked away. I think this was a really nice watch, Perhaps there were problems I do not see, or that my naivete is hiding from me, but I would say this is a really good watch. Now is it worth the $225,000 it achieved? Well I think it fits in the ladder of my expectations. This is a fortune for a watch, and we are in rare air. My thoughts are that the buyers for this watch are different to most of my Speedy friends so its hard for me to really feel what is going on. What I do think is that many people might have guessed this would have gone for more – however there was not the fight in the saleroom that I for one was expecting. In conclusion, I felt the two 2915’s at Phillips were very attractive, and sold for less than I was expecting, and that perhaps the auction estimates were too high. (Therefore makes me think these were trade watches – but that is another story). Phillips showed a 2915-3 that will be offered in Hong Kong. Here we see the Broad Arrow hands combined with a black BASE1000 bezel. The estimate is a probably realistic USD$60,000 – $100.000. My impression was, its OK, but after seeing the other two, it made me like those two in Geneva more – it can be deceptive, when you see a really good watch in isolation, especially an expensive one, sometimes you do not really get it until you see the lesser quality soon after. The dial is a nice colour, and undamaged, the impression is good. The hands might also have been re lumed and the centre chrono seconds hand is painted, and I would have expected a metal one in an original watch. But all in all this looks pretty good for the price. The BASE1000 bezel like many does not look attractive, but it is still one of the better ones I see. Which is my problem with the BASE1000 black bezel – they often look grey, illegible, dry or tired. Just not a nice thing to be looking at on a $60k+ watch. Another way to look at it, is to ask is this 2915-3 a better value route to 2915 ownership than one of the $200k watches? The estimate on the above watch is $60,000 to $120,000. This watch set off the Gieger counter and the dial looks ok. The bezel has serifs and shows circular polish lines. I think I had seen so many by this stage, it was a case of oh, another 2915, so what? So viewed in isolation this might be an interesting watch. By this time I had 2915 fade. Christies showed one that will sell in New York 6th December. This watch shows very original, but it is shagged. The case is completely polished and without definition, the lume on the hands is positively botanical, but it really does look like a watch that has been owned and used for most of its sixty years. For a price, it is likeable. 2915-1 previewed in Geneva to be sold in New York in December. This watch is offered with an older extract and is really not in the same league as the Phillips watches, but it does have an attraction, in that I do not think it has been messed around with. We might even guess that this is an original bezel – but this highlights the problem with the steel bezels – what is an original? How many styles were there? What was the manufacturing method? Note this bezel does not have the circular polishing marks, but it does show it has been polished on a flat surface by hand with perhaps a fine abrasive. Something that would almost certainly be routinely done to bezels during service when the watches were considered tools.